Published by A. J. Galpin & Co., Market Place, Norwich, c.1880-1900. 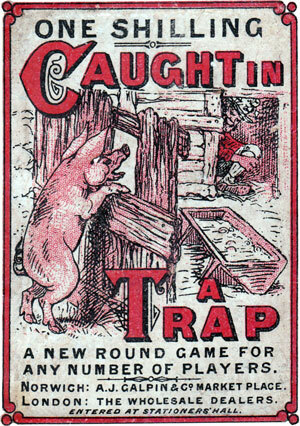 A Victorian card game consisting of 12 sets of 4 cards, each set telling a story of a victim being ensnared in a trap, being caught, and finally escaping. Credits: all images and notes courtesy Rex Pitts. I took a little trip down to the Norwich Reference Library to see what I could find out about these cards. We had a disastrous fire at our City Centre Library in 1994, so our reference section, as well as the lending section, has been decimated. A new library has been built in the new Forum, but it will not replace the books we lost. There was a postal directory for Norwich still available for 1897, but A J Galpin was not listed. However they did appear in the 1900 Kelly’s Guide at No 18 The Walk, Market Place as a Fancy Repository. They were also listed under Toy Dealers, but not under Printers. From this I concluded that they must have had the cards printed for them as they did not seem to be printers themselves. From an incomplete set of Kelly’s Guide, I was able to determine that in 1904 there was no Galpin in Market Street and this must mean that the cards were produced between 1880 and 1903. Around 1910 they moved into the beautiful Art Nouveau Royal Arcade built in 1899 in Norwich as they are entered as such in the 1912 Kelly’s. The proprietor was a Miss G Galpin. At this point I thought I had got all the information I was going to get, but I had an idea. Galpin is an unusual name so I looked it up in the local telephone directory and found a couple of entries. As luck would have it the first number I rang turned out to be the one I was hoping for. Mr Galpin told me that Miss G Galpin was his aunt and that her father, A J Galpin, had come to Norwich from Dorset in the late 19th century and set up business here. The business had passed on to his daughter but she had sold up during the First World War to go and become a nurse. The business had been bought by Langleys who have subsequently become a very substantial toy retailer. In fact, having traced and spoken to the ex-manager (1960 – 1985) he tells me that they were the second largest toyshop in Britain in 1975 after Hamleys in London. The companies mentioned on the cards namely John Cook on set 5 is listed in 1879 as a victualler and measure maker and Jewsons also on set 5 is listed as a coal merchant and importer of deals and timber. Jewsons have more recently become known as having “the Jewson lot” when it comes to building supplies, according to the TV advertisements.